Without any doubts, avocado is among the most popular fruits in the United States and all over our planet and the health benefits of avocado are mutual. The beautiful, sweet taste makes many people wonder whether it is good to eat avocado or not. The truth is that avocado is packed with nutrients and there are many different health benefits of avocado, so you don’t have to worry about that. In addition, individuals who consume avocado regularly are much healthier and fit, maintain adequate nutrient intake and they also have lower BMI compared to individuals who avoid avocado. This fact was confirmed by several scientific studies. 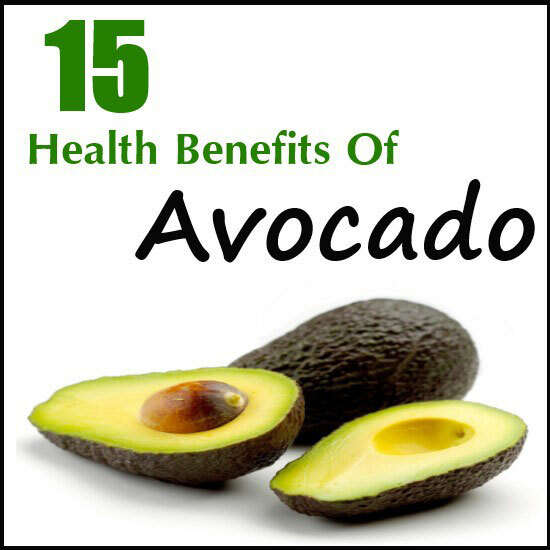 As mentioned above, avocado carries many benefits which are important for health and only 15 of the most valuable health benefits of consuming avocado will be highlighted below. Avocado contains surprisingly high amount of fats, but in this case we are talking about goof fats like monounsaturated fat. This fat has the ability to decrease the chances of experiencing heart attack or stroke and lowers the levels of harmful cholesterol in the system. Eating avocado regularly can also support the process of losing weight. A scientific study released in the reputable Nutritional Journal reveals that just a half of an avocado (average avocado) eaten with lunch help people who are overweight to avoid food cravings for a very long period of time after they have finished their lunch. It was also confirmed by the study that 40% of the people, in the following three hours, felt less need to consume food and 30% in the following five hours. What is even better is that they were not thinking about snacks at all. One of the biggest health benefits of avocado is to lower the blood pressure. According to AHA (The American Heart Association) potassium is a mineral that can lower the impact of sodium on systems of the body. In addition by regularly consuming foods abundant with potassium your blood pressure will be stabilized. It turns out that avocados are rich in potassium too. One average avocado has about 30% of the daily recommended intake of potassium. Of course, we should not forget that avocados are packed with fat, so try to avoid taking other foods that are rich in fat. The legitimate statistics reveal that the adult population of America (about 30%) has problems with high cholesterol. This means that there are a lot of Americans who have greater possibility to establish heart disease. Luckily, there are several completely natural methods that can help people stabilize their cholesterol levels. It was confirmed in some scientific studies that consuming avocado regularly can aid people to reduce cholesterol. This fruit is able to lower cholesterol levels drastically. In addition, they can reduce LDL cholesterol (bad cholesterol) and improve the levels of LDL cholesterol (good cholesterol) while reducing blood triglycerides. The health benefits of avocado are great because is packed with nutrients. Each serving comes with about 20 various vitamins and minerals. There is only a small number of people who are familiar with the fact that the consumed amount of vitamins, minerals and other nutrients is not important. What matters is how successfully our body absorbs these nutrients. For instance, the nutrients that are soluble in fats can be properly processed only if they are consumed with fat. Good examples of nutrients like this are vitamin D, vitamin A, vitamin K and vitamin E and a few different types of antioxidants. Using only half of average avocado in salad made of carrots, lettuce and spinach will help your body absorb lutein 4 times better, beta-carotene 13 times better and alpha-carotene antioxidant 8 times better. According to CDCP (The Centers for Disease Control and Prevention), it is very likely that 4 out of 10 Americans will experience diabetes problems in their lives. This means that stabilizing the levels of sugar in the blood is essential for everyone because thus the chances to develop diabetes are at low scale. Avocado is one of the best fruits for this purpose because the health benefits of avocado are very powerful. A study, which was scientific, made not quite ago on individuals who have consumed lunch together with half an avocado (average avocado). A few times a day their sugar levels in the blood were noticed as soon as they finished eating. Despite the increased carbs and calorie intake after the consumed avocado, the people who were part of this study have not experienced differences in their sugar levels in the blood. In the contrary, the ones that followed the same diet without avocado have dealt with increased levels of blood sugar. The extract of this fruit is able to lower the signs and symptoms of osteoarthritis or arthritis of the bones. Avocado is known for his powerful anti-inflammatory properties. Aches, pains and other kinds of inflammation can be eased with it. Many experts claim that chronic inflammation in any body part leads to a wide range of diseases like arthritis, allergies, asthma, cancer, heart disease and Alzheimer’s disease. Avocado contains oleic acid, a type of monounsaturated fat that is usually found in olive oil. Numerous scientific studies have confirmed the efficiency of oleic acid against inflammation. Both zeaxanthin and lutein are very helpful when it comes to eliminating macular degeneration which is one of the main reasons for the occurrence of blindness in men and women. Foods that are packed with phytonutrients contain high quantities of these nutrients. Avocado is listed as one of the richest sources of lutein and it also contain a solid amount of zeaxanthin. What to Expect magazine says that avocados are very helpful for women who are expecting a baby. The reason is simple – this fruit is rich in potassium, folate, vitamin B6 and vitamin C. it is good to point out that vitamin B6 supports the formation brain growth of the fetus and soothes morning sickness in future moms. On the other hand, folate is crucial for the proper development of the fetus. More than one scientific study has shown that avocado brings benefits to people who are dealing with cancer. One of these studies has confirmed that the extract of this fruit may completely stop or at least slow down the growth rate of prostate cancer cells. Moreover, one other study has proved that the extract of avocado may calm the side effects of chemo. Keep in mind that these studies are just an early indicators, so don’t expect too much. These fruits are loaded with nutrients that are good for our bones. Some of these nutrients include folate, copper and vitamin K. Taking avocado on a regular basis can help people maintain the strength and density of ones and that is another proof that the health benefits of avocado are great. If you want to enhance the effects, eat avocado together with other veggies and fruits. In order to help the work of our digestive system, we must consume sufficient amount of fiber. So, eat more avocados because only one avocado comes with 13 grams of fiber which is about half of the daily recommended intake. As we all know, minerals and vitamins (especially folate and potassium) have the ability to boost our mood and this is how avocado can help you. Some scientific studies have shown that there is a connection between insufficient amount of potassium in the body and depression. The results of a few studies that were studying the connection between magnesium, sodium and potassium in patients dealing with depression has shown that the levels of potassium at both men and women suffering from depression were very low. In the end, 12 years ago a study was conducted and has revealed the same results – the potassium levels were low at people dealing with depression. Scientists have confirmed the fact that folate is great for elimination of bad mood, anxiety and depression.